Bay Area food marketer has touted trend since 2015. This year, the Specialty Food Association listened. Detail of CCD Innovation’s poster forecasting food trends for 2018. Q&A with food trends expert Kara Nielsen about cannabis cuisine ahead of the Fancy Food Show in San Francisco next week, where Nielsen and other members of the Specialty Food Association will gather for the West Coast’s winter trade show expo. I interviewed Nielsen, who this year elevated cannabis cuisine to Big Foodie’s attention. Nielsen is currently vice president of trends and marketing at CCD Innovation, a Emeryville company that blah blah does blah. She first predicted the mainstreaming of cannabis cuisine and cannabis edibles in 2015 while working for a food marketing company in Boulder, Colo. While you won’t find anything infused with anything more intoxicating than chocolate liquor on trade show floor, cannabis cuisine has landed on the Specialty Food Association’s radar — named No. 8 on the list of the SFA’s Trendspotters’ forecast of 2018, a notice that exhibits no influence at the Fancy Food Show but marks a mainstreaming moment as the formerly outlaw herb goes legal in the Golden State’s capital of food and cannabis. Nielsen and other Specialty Food Association Trendspotters — an expert panel comprised of marketers, journalists and other tastemakers — will be roaming the Fancy Food Show trade-show floor at San Francisco’s Moscone Center next week, looking for new and innovative products to recommend. You won’t find cannabis edibles at the Fancy Food Show, but you don’t have to go far to find them. And you may do double-takes when you do, as many of the edibles on sale in in San Francisco’s adult-use recreational cannabis stores look like they might have loaded up and sneaked over from the Fancy Food Show. 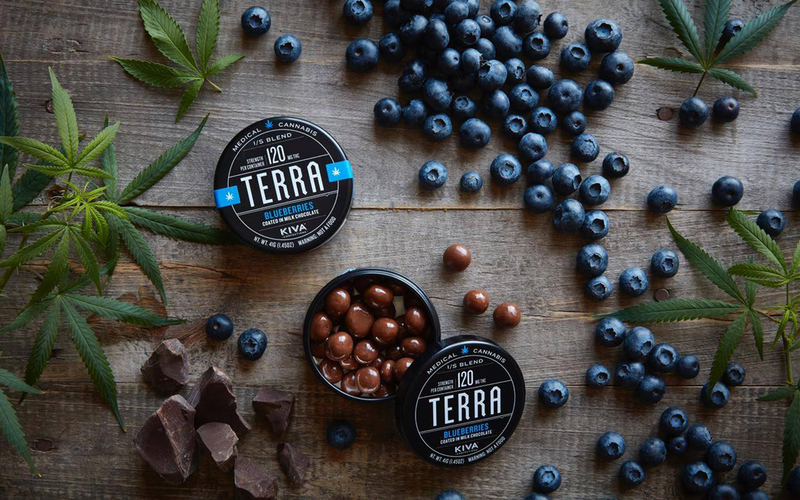 Designed for health-conscious consumers by chef Ezra Malmuth, these sophisticated edibles deliver moderate 20 milligram doses of THC in bite-sized clusters made of dried fruits, nuts and spices. Intended to match shifting moods and deliver functional benefits, expect sophisticated flavors and thoughtful cannabis pairings from each one of chef Ezra Malmuth’s four creations — Nimbus, Origin, Ember and Stratus. Mexican chocolate, spicy pepitas and chiles blend with an indica strain in Origin. 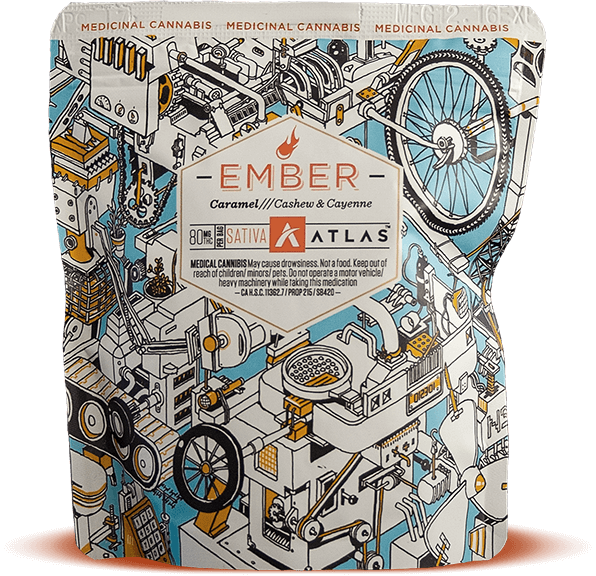 Cashew, apricot and cayenne add spice to a sativa in Ember. Each package contains four clusters for 80 mg of THC total. Defonce (French for “high”) turns out exquisite candies dressed up in modernist-glam packaging. The chocolate’s cannabis oil is derived from sungrown, single-origin biodynamic produce from Hummingbird Medicinals’ Sierra Foothills farm;. It’s blended with Fair Trade chocolate, sugar and other ingredients. Found in dispensaries across California, flavors include vanilla, matcha, coffee, mint and hazelnut, as well as 53-, 66- or 88-percent cacao chocolate. With new edible products crowding dispensary shelves, Garden Society stands out with its impeccable ingredients and beautiful gummies and chocolates with no grassy taste. Perfect for new users of cannabis, these low-dose treats contain only 5 or 10 mg of THC. Bliss Blossom chocolates are luxuriously silk indulgences; Bright Blooms gummies are made with real fruit. The company was founded by a chemical engineer, Erin Gore, who found that cannabis brought balance to her professional life and healed her pain from a debilitating hip injury — and who clearly has a talent for making delicious treats. An independent, woman-owned-and-operated non-profit, Kush Nuts produces a savory blend of cashews and almonds infused with premium, strain-specific cannabis butter. Each batch is handmade and lab-tested to ensure consistent quality and potency. With 45-milligram THC and 90 mg-bags offered in sativa or indica, Kush Nuts appeal to both the canna-curious and connoisseurs. Infused with strains like Dragonfish Farms Red Congolese and Granddaddy Purple, the treats are sugar-free and gluten-free, and packed with protein. This infused-olive oil company delivers what cooks demand: a product with clear and consistent dosing, explained in an easy-to-understand label on a stylish bottle. There’s no need to do your own math. One teaspoon of oil delivers 5 milligrams of THC, marijuana’s main active ingredient. Five milligrams of THC is a great starting point for almost everyone exploring cannabis’ effects. An excellent gift for any aspiring cannabis cook, Pot d’Huile makes it simple to add THC to any meal. The neutral-tasting oil is also perfect for culinary professionals, fueling a growing chefs’ movement into experimenting with cannabis cuisine. Infusing gourmet treats and snacks with THC and CBD, Auntie Dolores creates high-end foods with quality ingredients, including gluten-free, low-glycemic, vegan and paleo items. Day Dreamers’ chocolates are crafted for foodies’ palettes and cannabis patients’ needs and come in a variety of doses and combinations of cannabinoids. Flour Child relies on organic, seasonal fruits to craft its delicious small-batch jams infused with rosin, an extract created by heating and pressing cannabis flowers. Habit uses real fruit, natural flavors, no fructose corn syrup, and clean, solvent-free cannabis oil in its highly carbonated, delicious and super-potent sparkling fruit drinks. HigherVeda uses the ancient Indian system of Ayurveda in harmony with cannabis, creating products designed to support sleep, arousal, alertness and fitness. Superfood specialists Jambo deliver healthy, award-winning infusions like their popular cannabis ghee, which can be used as a base in hundreds of dishes. The first products from the Knutson brothers, Keef Cola beverages mimic the classic flavors of mainstream soda with a range of THC and CBD strengths. Manzanita & Madrone’s “brewmasters” combine atypical ingredients to create boutique infused sodas, including Ginger Root Fizz, Lemon Lime Fizz and Fire Cider Tonic. Expertly disguising the herbaceous flavors of cannabis within organic juice, Mary Jane Juice has scored with its Strawberry Basil flavor and its vegan “Earthling” green drink. Containing nutrient-dense superfoods, Lift Bars from Native Seed are vegan and gluten-free. Balanced ratios of CBD:THC offer a superior edibles experience. Yummi Karma’s perfectly dosed and flawlessly crisp THC-infused snacks like potato chips, tortilla chips and popcorn are some of the most coveted medicated munchies. Offering cannabis-infused coconut oil, peanut butter and both sweet and savory honey-coated almonds in stylish packaging, Zendo Edibles fit perfectly into busy lifestyles.